Nine birds treated after being found by the Scottish SPCA in Peterhead. Nine seagulls have been left "severely contaminated" by cooking oil. The Scottish SPCA found the nine birds in Peterhead, following a call from a member of the public. 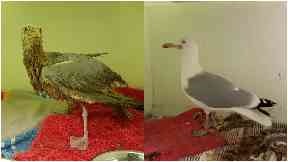 They were then taken to the charity's National Wildlife Centre at Fishcross in Clackmannanshire for treatment. The charity is now warning people to consider how and where they dispose of oil. National Wildlife Centre manager Colin Seddon said: "We recently received nine birds which had been severely contaminated with cooking oil. "Within a day of their arrival they were washed and treated to minimise any ingestion and feather damage. "We are unsure how the gulls became contaminated but it is often due to oil simply being dumped, washed down a drain which eventually ends up in a river or estuary or even from a rubbish tip where gulls often feed. "Thankfully all nine birds made a full recovery and were released back into the wild." If the public encounter a contaminated river or water environment they should contact Scottish Water. Those who discovered an injured wild animal should contact the Scottish SPCA's animal helpline on 03000 999 999.